A cool breeze and a warm smile greet me as we enter the white façade of the Lyfe Medical Wellness building; the air-con a necessary reprieve from the 30c+ temperatures outside. A short distance away are the longtail boat drivers and coconut vendors that roam Rawai Beach. Walking inside cleanses you from those tourism sales pitches and that’s what I’m here for. To be cleansed by ozone and IV treatments. I’m with two friends at Lyfe Medical Wellness for, well… medical wellness treatments. I’m fatigued and run down, my digestion is on a continual slowdown, and my food intolerances are creeping up. I’ve been searching for a therapy that can give my body the much-needed boost it deserves. My doctor back in NZ recommended ozone therapy as a way to combat the results of chronic stress. As a digital nomad, seeking a reputable clinic on the road is not as simple as it looks. You need assurance that it is not only a sterile and professional environment but also that it delivers high medical standards. Ozone therapy is a powerful healing treatment with the ability to strengthen the immune system, kill bacteria and viruses on contact, reduce inflammation and acidity, and increase energy. It’s also used as a cancer therapy, halting the spread of cancerous cells. Ozone therapy has been used in healing treatments for over 150 years — even Tesla was in on it, patenting the first O3 generator in 1893. Reassuringly, while the Lyfe Medical Wellness clinic is new, the team that runs it are not, with long-standing careers in the wellness industry. 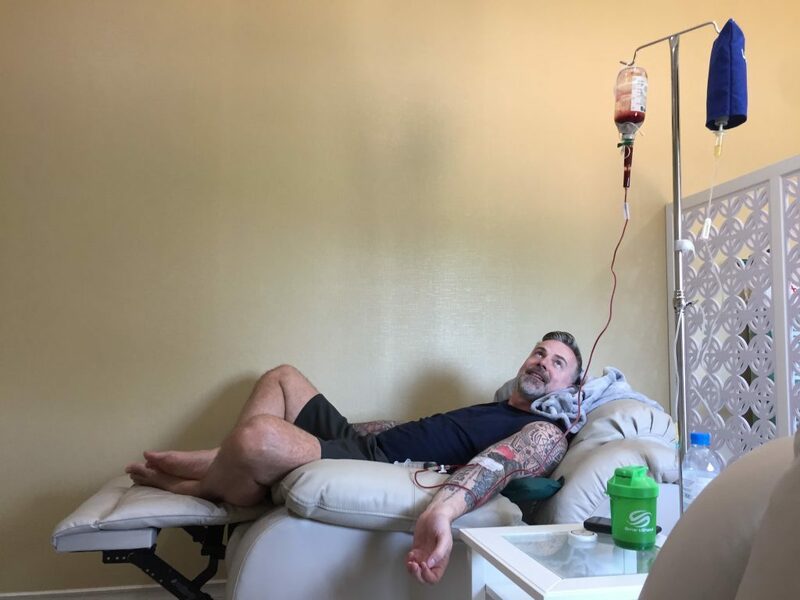 It’s due to their past relationships with the owners of Phuket Cleanse (fitness and detox retreat that I’m recharging my health at) that I’m confident that I’ll receive the same standard of care that I would at home. For a fraction of the cost. Once I’ve filled in the intake form and had my vitals taken, I’m introduced to Dr. Sutthi, a mellow fellow with a quiet disposition. Dr. Sutthi quickly demonstrates that beneath his mild-mannered demeanour is a doc who knows his stuff. A Thai national, Dr. Sutthi has been practicing for over 30 years. I go through my medical history with him, undertake a Bioscan test and based on the doc’s recommendations; I’m taking to the lounge for ozone and vitamin IV therapy. Ozone is O3, a gas that combines three oxygen atoms that fight free radicals. While it can be administered in a few ways, blood ozone is the most popular. The O3 formula is added to your blood, and then re-administered back to you for it to work its magic. It’s kind of like a ninja kick to your damaged cells across your body. The treatment takes 90 minutes from the comfort of a reclining armchair, under the supervision of a knowledgeable and friendly nurse. Ozone, when administered correctly, is considered one of the safest therapies out there. 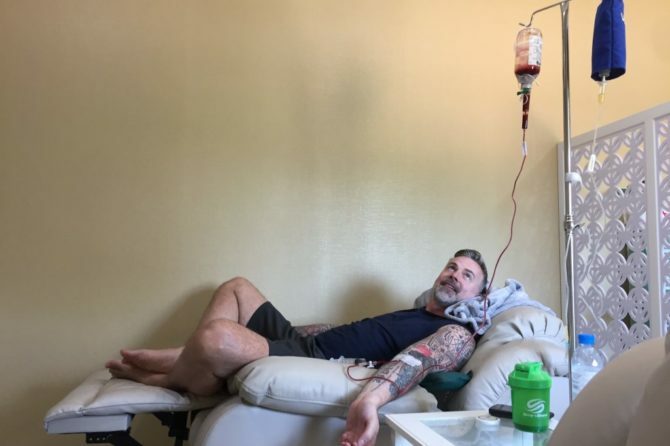 After the ozone, I’m switched to a vitamin IV drip. While I’m at the beach and cocktails are common, this is a different kind of concoction. Similar to a Myers IV, the 500ml bag contains vitamin C, B6, B-complex and magnesium. The order of ozone, then vitamin cocktail is important. The ozone strengthens the body to welcome the IV nutrients and it’s helpful to combine them. The ozone alone is boosting my immune system and rebalancing my cells, but followed by a 60-minute vitamin injection, it delivers a much-needed nutritional boost to my fatigued body. My buddies aren’t here for the same reason. One has a cold he can’t shift; the other wants to train harder. Our IV bags have a personalized brew for our specific needs. It was pleasing to note that I wasn’t just given what I asked for. As I’m often low in iron, I requested a boost but Dr. Sutthi checked my nails and eyelids first and declined, declaring my iron levels sufficient. As we wrapped up our session at Lyfe, it was clear to see the effects immediately on my UK friend Pete. His eyes were brighter, his skin looked like he’d had a killer facial and, after a week battling cold and flu systems, he declared himself “back in the game”. Due to my compromised health, it was my second session where I began to get my bounce back. For the average person with a good level of health, three visits are considered optimal. I’ll definitely be back for more. Lyfe Medical Wellness is a great asset to the Southern Phuket area, particularly in support of all the detox and fitness facilities found here. Whether it’s a wellness boost, to get a bug to bug off, or to tackle more chronic issues, it’s worth stopping by to meet Dr. Sutthi and the team to get your health back on track. Can I please have a appointment in rawai for as soon as possible for a vitmain IV drip?